We want to let the image speak for itself, so will keep this entry brief. What you see below is approximately one year of Twitter video game-related chatter from the period of July 27 2009 to July 22 2010. It shows the 150 most commonly used words in gamers' tweets. 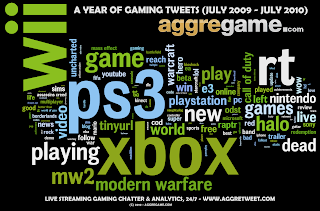 The graph was generated using over 28 Million gaming-related tweets collected by AggreTweet - a live streaming aggregator for gaming conversations happening on Twitter. Platforms, Games, Events - even Communities like Joystiq and Kotaku have real-time feeds on AggreTweet. Are these tweets gathered using #hashtags or regular text? Your design choices seem odd. PS3 is Wii aqua? Wii is Xbox green? Xbox is olive? And why is Wii vertical when the other two consoles are horizontal? You've instantly made it have less visual priority. But seriously that olive and mint green look like poo together. Navarro thats rubbish, the Wii text stands out just as well as the PS3 and Xbox text. And the colours are not meant to represent console colours and all work together really well. Does the size of the text represent it's popularity/usage IE bigger = used more smaller = used less. Strange I have looked all through and cannot see "360" anywhere. The font sizes absolutely represent the popularity. The larger the font, the more popular the keyword. You don't see "360" because it is a number, and we specifically excluded numbers from this data set (with the exception of ps3 and bfbc2). Take "Uncharted" and "Uncharted2" for example. People tweet both out very frequently. But "Uncharted" is still the most frequent word in the phrase "Uncharted2" - so we combined the two data sets, and dropped the "2" off for presentation purposes. It wouldn't be fair to not show it just because the consumers of Uncharted are split on the nomenclature. AggreTweet itself tracks ALL plausible ways to write about a topic. Take "Call of Duty: Black Ops" for example. We pick up tweets that mention: COD7, Call of Duty 7, CODBO, COD:BO, COD: Black Ops, Call of Duty: Black Ops, #BlackOps, #CODBlackOps, Call of Duty Black Ops, callofdutyblackops, and every logical permutation of white space insertions imaginable. Thus, no matter how uncertain a population is on the proper nomenclature for Tweeting about a game, we get their discussions nonetheless. However, this Infographic isn't combining all mentions of the games into a single bucket, and using that to determine its popularity. So just because some games have a greater number of keywords than others does not put them at any greater an advantage - because "COD:BO", "COD: Black Ops" and "#COD7" would NOT put +3 in the "black ops" bucket - only one drop would go in the "black ops" bucket, thanks to "COD: Black Ops." * yes I realize these were very likely not hand-picked. but in light of the fact that noone knows how these tweets were gathered.. I'm going to leave it as it. Kim Kardashian Hollywood Hack – Cheats Tool is a software that will give you unlimited money and stars! It is also tested and has no viruses and no survey is required.